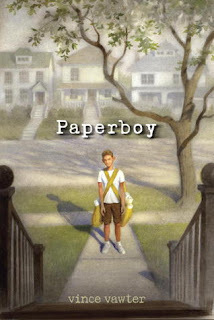 On Tuesday, we shared our review of Paperboy by Vince Vawter, a super special book about a boy with a stutter who takes over his friend's paper delivery route one summer and learns more than he could have ever expected about the unique people in his community but moreso about himself. Today, we are ecstatic to welcome Vince Vawter to answer some of our burning questions about Paperboy! Random House Children's Books has also offered to give away a copy of Paperboy. To enter, see the form at the bottom of the post. Without further ado, here is our interview with Vince! TMT: Paperboy is based on your experiences as a child with a stutter. The main character’s story has a lot to do with overcoming his struggle with stuttering but also with gaining confidence and self-esteem in general. Can you share more about how a stutter might impact a person? Vince Vawter: A person who stutters and tries to hide it, especially an adolescent, has a hard time being himself/herself. The person seeks to compensate by concentrating on secondary skills. In my case, it was athletics. There also is the confusion of having the outward appearance of being normal, but then all normality vanishing when talking is attempted. When this happens many times a day, day in and day out, the psyche is undoubtedly affected. There also is a heavy “why me” quotient. Talking is so easy for most of the people on the planet (some might say too easy). “Why have I been singled out?” is the inevitable question. Some adults, while they still might possess a stutter, outgrow the self-imposed shame. In some circles, it is called “letting go.” After all, stuttering is what you do when you try not to stutter. TMT: In the author’s notes you mentioned that the book was more memoir than fiction. What parts of the story were added that did not happen to you? Vince Vawter: The only character in the book who does not have a counterpart in my childhood is Mr. Spiro. Halfway through writing the book, I realized that Mr. Spiro actually is the present-day Vince Vawter. All the narrative action in the book has some basis in fact. For instance, while I did not witness a stabbing, I did watch a junk man die under the hedges in our backyard. I did not accompany Mam to a “juke joint,” but Mam’s predecessor, unbeknownst to my parents at the time, would haul me off to a similar place during the day where I would be served milk and she would partake of other libations. That’s the reason Mam took her place. The speech events (fainting, biting through my tongue, thumbtack wounds, throwing up) are all happenings from my childhood. I did substitute on a Press-Scimitar newspaper route and I did have a pretty good fastball. And I did love Mam with all my heart. I never have thought of her a “housekeeper.” She was my dearest friend and more of a “soul keeper.” There was a question about my biological father, but this didn’t come about until many years later – 50 to be exact. TMT: Paperboy is your first book but you worked and wrote for newspapers for 40 years. How was the transition from writing and working for a newspaper to writing and publishing a novel? Vince Vawter: The process was more complicated than I had ever imagined. The first challenge was to learn to show and not tell. I also had trouble introducing a fictional overlay to a true story. When should I invent and when should I stick to the facts? It was a constant struggle. Mr. Spiro finally helped me out on that one when he told the paperboy that more truth can be found in fiction. TMT: The voice in Paperboy is very specific because it is how the narrator would have typed the story. Why did you choose to tell your story this way? Vince Vawter: While I did bang around on an old typewriter as a boy, I didn’t attempt to write stories. When I started writing my narrative, it occurred to me I wished I had put my thoughts down on paper as a child. I found that the typewriter was an easy conveyance for me to return to my adolescence. I began each writing session with the thought: “What would the paperboy have typed about . . . “ It seems my old, arthritic fingers could almost feel the boy’s 11-year-old fingers on the typewriter keys. TMT: It seems like the story with Mr. Spiro is not completed. Are you planning a sequel? Vince Vawter: The thought frightens me, but I did leave Mr. Spiro at loose ends for that very reason. You are perceptive. My agent says that my readers will let me know if they want a sequel. I’m listening. TMT: At first glance, Paperboy seems to be only about a child overcoming stuttering, but there are deep topics such as race relations, education, loss of hearing, and philosophy all within a historical fiction background. What compelled you to tackle so many tough issues? Vince Vawter: The first incarnation of Paperboy was for a general audience. My agent and then my editor convinced me to redirect it to a younger audience. I didn’t think it could be done and still retain all the sub-themes, but somehow I found the path. My mentors kept telling me to have faith in my readers. I continue to believe the novel can be read on several different levels with each reader bringing something different and carrying away something different. You left out one topic -- attention deficit disorder. The paperboy says that thoughts went around in his head like the pinball in the machine at the drugstore. While there is no empirical evidence, I believe there is some connection between ADD/ADHD and stuttering. The answer will be in the genetic code. Vince Vawter: I certainly agree, but I think you have to be a special type of reader. I tend to read at two different speeds, much too fast and excruciatingly slow. I speed read for information, but when I find myself drawn to a certain style of writing, I put it into low gear and read at a crawl, sometimes reading aloud to myself. I can hear the paperboy’s voice much better when I read it aloud. Vince Vawter: Reading is . . . a close second to breathing, it being difficult to exist without either. Writing is . . . the path to understanding. We are so glad Vince shared the story in Paperboy and then some insight into his life as a reader and writer with us here at Teach Mentor Texts. To win a copy of this great book, please complete the following form. Be sure to visit these other great blogs on the Paperboy blog tour!